LiveWeb - insert and view web pages real-time. Use LiveWeb to insert web pages into a PowerPoint slide and refresh the pages real-time during slide show. Display web pages without ever leaving the confines of your PowerPoint slide show. No coding required. LiveWeb works with documents off your local drive too. You can specify relative paths. LiveWeb will also look for files in the presentation folder if the files have local drive information and cannot be located at the location specified by the user during slideshow. LiveWeb encapsulates the need to insert a web browser control manually and write code to update the web pages within the control during the slide show. It consists of two components. 1. Wizard component - Create a list of web sites which you wish to add to the slides. 2. Real-time update component - Automatically refreshes the page every time you visit the slide which contains the web browser control. - Set the zoom level on the browser page. To purchase the source code for LiveWeb for commerical branding email Shyam@Mvps.org. If you enjoy using my free addins, consider donating. Donations help keep the new add-ins, updates coming and help pay for the time spent maintaining and improving the software. Donations are entirely voluntary. But every donation is greatly appreciated. 1. Extract the setup file from the zip. 2. Run the installer and install LiveWeb. 3. 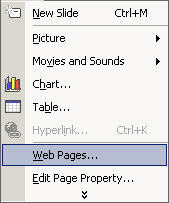 Launch PowerPoint and select the Insert tab to view the menu items. 6. You might be prompted with the macro virus warning. Enable the macros. When the Add-in is properly loaded, it will display a 'X' against the add-in name.7. That's it. You have successfully loaded the add-in. Now put it to use. 1. Click on Insert | Web Page. Copyright 1999-2016 (c) Shyam Pillai. All rights reserved.